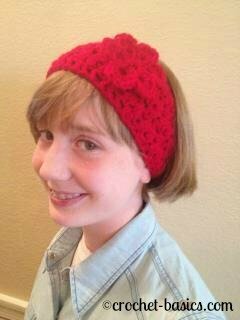 Learn to Crochet and Love It! Crocheting should be easy and fun. I can help make it just that by giving you all the information and instructions you need in an easy to understand way. What are the best books to help me? What are the simple explanations for all those crazy terms? How do you read a pattern? Are there easy to understand instructions? What are the different stitches? What are fun, do-able project ideas? Are there free patterns out there? Can I really learn to crochet? I had lots of questions. And, I had to look in lots of different places to find the answers. I’ve cut out all that legwork for you. There’s no need to jump from site to site. I’ve gathered it all right here -in one place. Easy to understand instructions, that is. Years ago, I decided to teach myself to crochet. How hard could it be? It turned out not to be as easy as I thought. It wasn’t because the information wasn’t there. It was. I found a lot of different sites that gave me lots of crochet terminology. They were filled with terms and abbreviations that didn’t make any sense to me. Terms like- ws, front post double crochet, tog, sc2tog, and picot filled my head . . . with doubt. Forget trying to read a pattern. I was lost! Needless to say, I had a hard time finding what I really needed . . . basic, easy to understand instructions. It doesn’t need to be that way. Learning can be a breeze when you have clear, simple instructions that walk you through the learning process. That’s what you’ll find here, step by step how-tos with lots of pictures to help you along the way. It's More Than Just Scarves and Doilies! 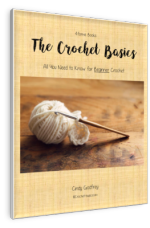 You’re going to realize that there’s so much more to crocheting than you ever thought! Did you know you can make necklaces, bracelets and headbands? You can and it’s so fun to do! I have lots of projects and ideas to get your creative juices flowing . . . from jewelry to animals to sweaters and flowers to beads and belts. The list goes on and on. Of course, you'll also find some great ideas for scarves, hats, doilies and blankets, too. I told you. It's all right here! So, Remember . . . Learning to Crochet Can and Should Be Fun and Exciting! Don’t let all the confusion scare you away. I can help walk you through those crazy terms and instructions right to your finished project. Just remember, you’ll learn at your own speed and your own pace. Don’t be in a hurry or feel like you have to get it all in one day. I’ll make it as simple as possible and help you all along the way. Before you know it, you’ll be making that beautiful afghan or those cute little baby booties. You’ll be showing off your gorgeous projects to me and I can hardly wait! You can crochet! So, let’s get started! 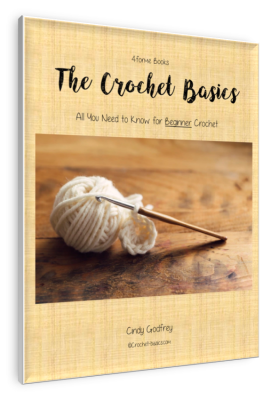 Crochet Essentials is where you learn the basics --all that need-to-know information. Besides yarn and a hook, there isn’t a lot of crochet supplies needed to get started. Learn here about the few that will help your projects turn out the best. Crochet help offers additional skills and techniques that will help you be more successful with your crochet projects. All crochet stitches are made by yarning over and pulling loops through. So simple! They differ only by the number of yarn overs and loops pulled through. 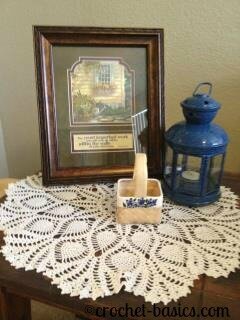 Textured crochet stitches add lots of variety and style to your project. Get started with them here. Learn some great, new, bonus crochet stitches here with walk-throughs and pictures. Learn all about different types of crochet and how they are created and used. In How to Crochet you’ll find super easy projects with how-to instructions from start to finish. Each has lots of pictures to help along the way, too. 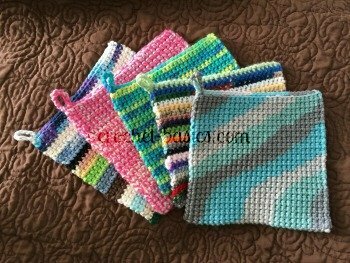 The Crochet Basics Blog will give you all the latest additions and changes to the Crochet-Basics.com web site. Subscribe here. Do you have a suggestion, idea or question for Crochet-Basics.com? Please, share it with me! I’d love to hear your comments.